You can create a course by copying one that already exists, or you can create a new one from scratch or from a course template. Open Courses from the Main Menu to manage courses in your domain. 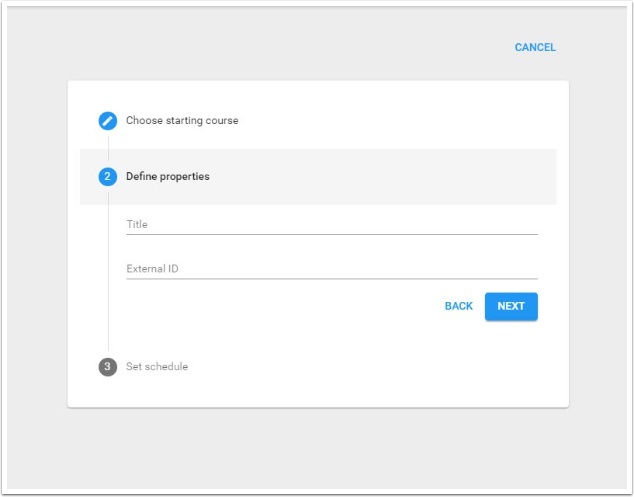 Select Create New and choose a course Template from the dropdown menu (if enabled) to bring over everything from that template. A template is selected by default, so select (Blank) if you don't want to use one. Provide Title, External ID, and, if you have multiple roles in the domain, the Role you want to have in the course. 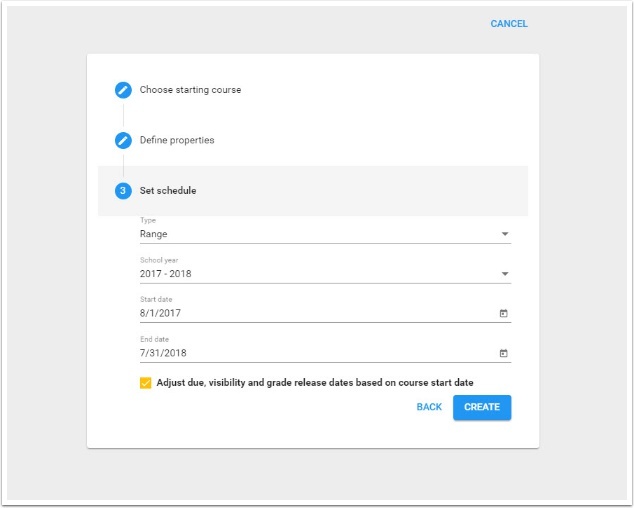 Range (by the course author); if you choose this, indicate whether you want Echo to automatically Adjust due, visibility and grade release dates based on course start date by checking the box or leaving it unchecked. Continuous (automated for self-paced learning); if you choose this, specify for how many days you want the course to run in the Days field. 7. Provide the desired Term. If your domain has Grading Periods set up, the Term field is replaced with a School year dropdown (as seen in the example). Select the current year to align your new course with the domain-level Grading Periods. 8. Specify the course's date range (Start date and End date). All course activities must be completed by the End Date; your students have read only access for two weeks after that date. If your domain has Grading Periods set up, these dates are populated for you based on the School year. Provide the Original Course name or ID of the course you are copying and click Next. A Static Copy is an exact copy of the chosen course. Choose this option when you want to create an independent copy of a course. Changes made to the copied course, known as the Master Course, have no impact on a Static Copy after it is made. A Derivative Child Copy is an exact copy of the Master Course and inherits changes to the Master. 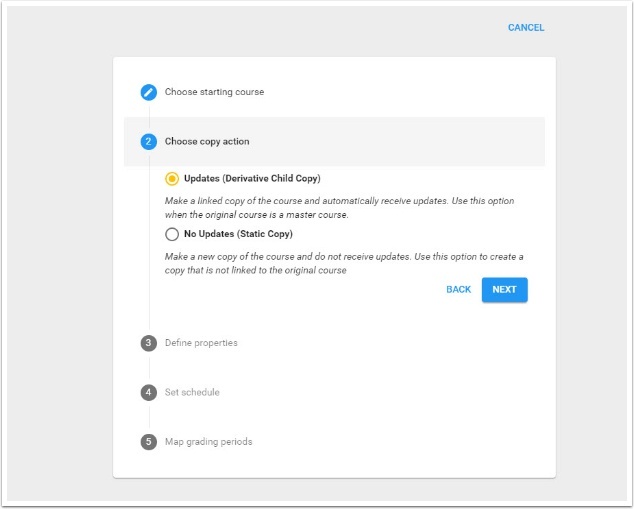 This option works best when you are copying a course with only content and no students enrolled because, once a Derivative Child Copy is made, you can no longer access student enrollment information in the Master Course. A Derivative Sibling Copy is an exact copy of a Derivative Child Course that continues to inherit changes to all unaltered elements of the Master Course. 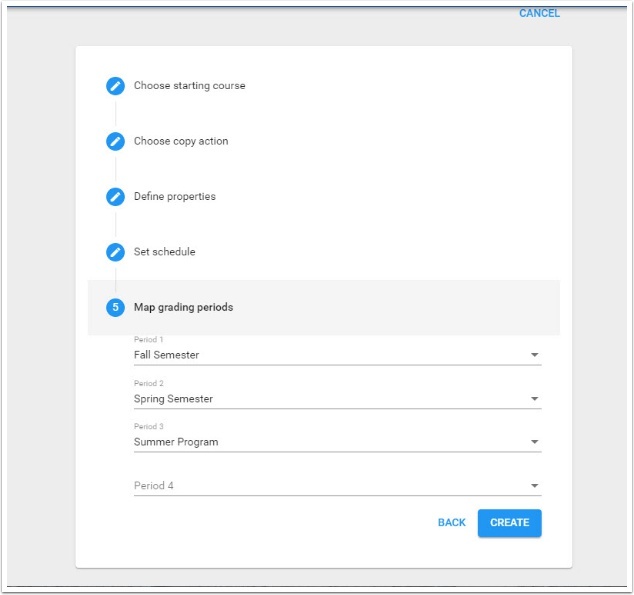 This option works best when you want to make a copy of an active course in which students are enrolled because, after making a Derivative Sibling Copy, you can still access the student enrollment information in the Master Course. 9. Provide the desired Term. If your domain has Grading Periods set up, the Term field is replaced with a School year dropdown (as seen in the example). Select the current year to align your new course with the domain-level Grading Periods. 10. Specify the course's date range (Start date and End date). 12. If your domain has Grading Periods set up and you're copying a course that already has its own Grading Periods, use this section to map the previous periods with the domain-level Grading Periods. Import courses using tab-delimited or comma-separated files. Fields, including Term (or School year if your domain has Grading Periods), Type (continuous/range), number of Days running, Start Date, or End Date. 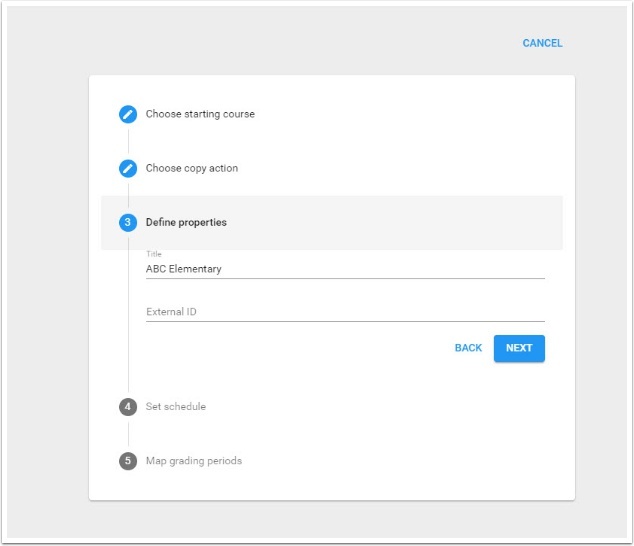 Template settings, including General Course-Grade View, Grade Scales, Grading Categories, Grading Periods, Options, Enrollment Completion, Formative Assessment, and/or Remediation Assessment. Delete a course by checking its box and clicking Delete; check multiple boxes to delete more than one at a time. Click Restore to review and restore deleted courses. 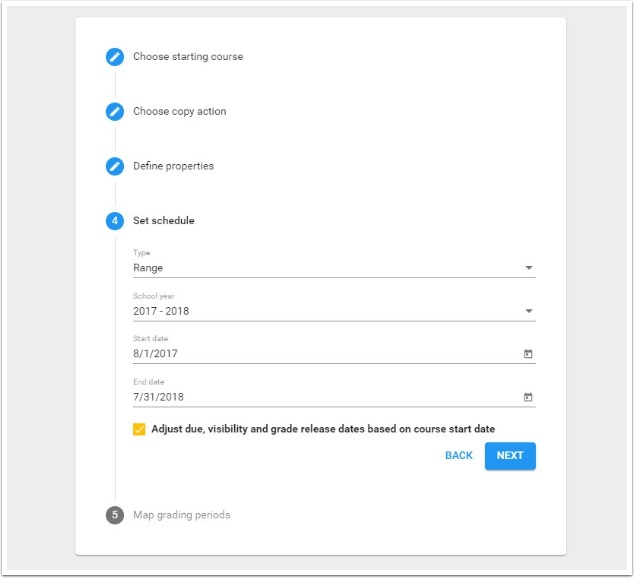 Select a Course ID to make changes to the Title, External ID, Term (or School year if your domain has Grading Periods), Public visibility, and Scheduling settings.